Because of its slightly mustardy taste, I have found that it pairs very well with whole grain mustards. I’ve tried it with both Tin Mustard and Lakeshore Whole Grain Irish Mustard with Irish Whiskey. I’m normally not a whiskey fan but this is such a great pairing that I let that slide. It can hold its own with strongly flavored crackers and with just a plain baguette. If you are in the mood for something a bit funky but still so very good, I wholeheartedly recommend this cheese. I live in Austin, Texas and frequent a European style cheese shop called Antonelli’s. 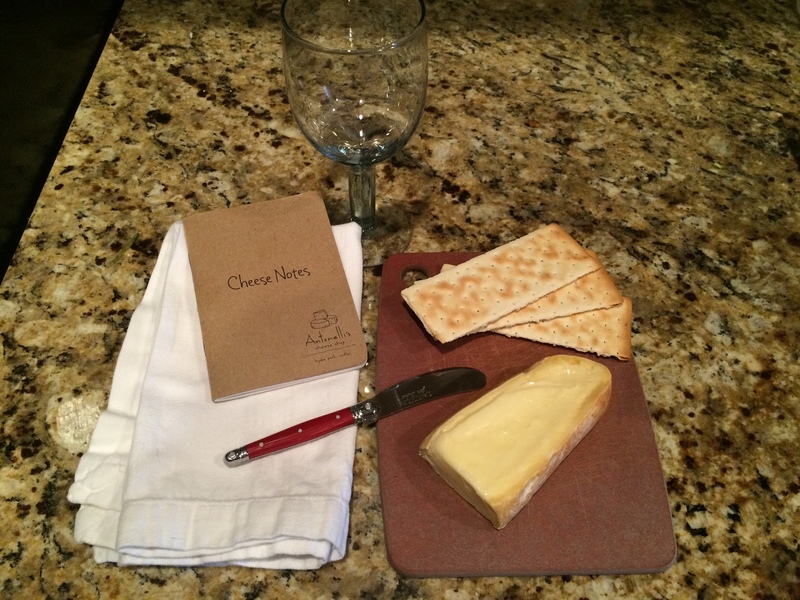 They are fabulous for so many reasons but I’m going to show you their Cheese Notes book. 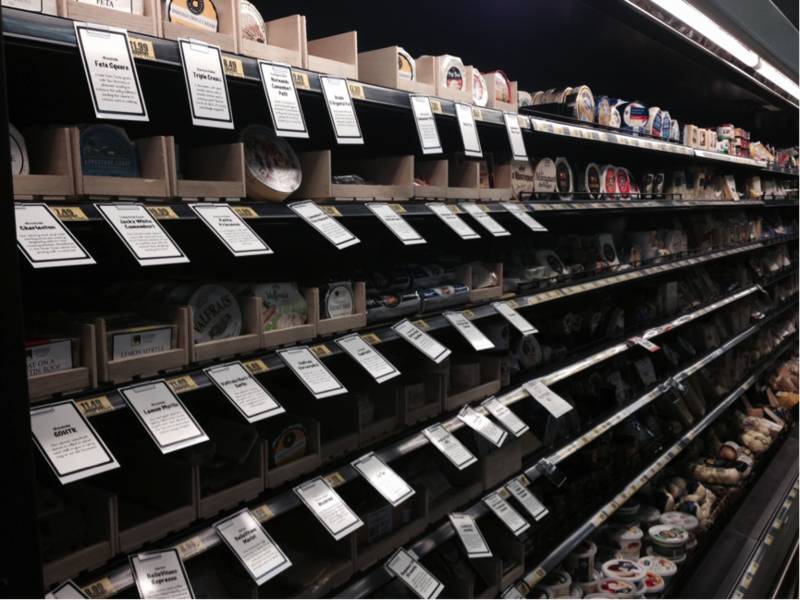 It is formatted to reflect their in-store charts and cheese icons. I’ve only filled one so far, however that’s only because I didn’t start out using it when I started on my cheesy adventures. 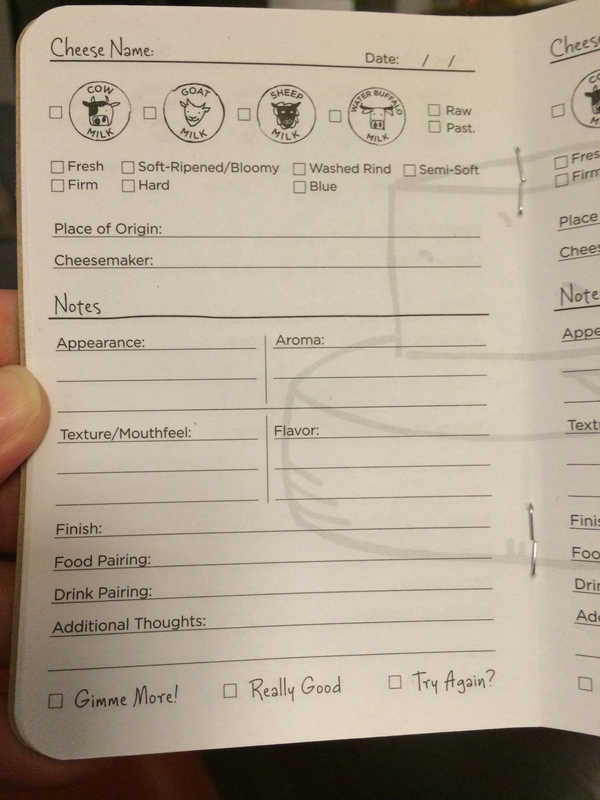 Each page has a space at the top for the name of the cheese and the date that you tried it. Then it gets into the really cheese oriented parts. You can record the type (cow, goat, sheep, or water buffalo), whether it is raw or pasteurized, the state of its firmness, or lack thereof, maker, place of origin and targeted notes. The notes part consists of appearance, aroma, texture/mouthfeel and flavor. The final section gives you space to list pairings and whether or not you’d like to have more. I know that not every cheese shop has a book like this available so I highly recommend making one. 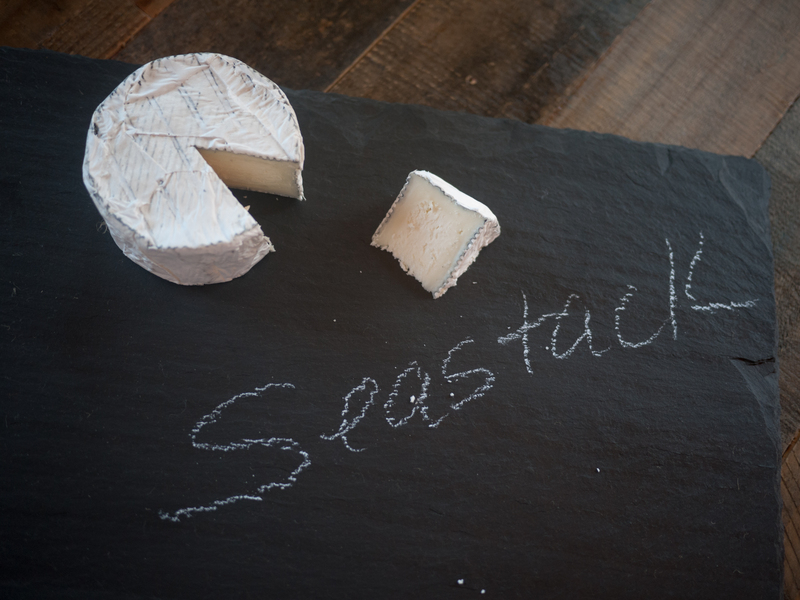 It’s such a great way to keep track of your cheese and helps with planning parties. It’s been exactly a month since my last post and once again I get to tie it into a holiday! I am admittedly a bit of a theme queen so this is right up my alley. Even more because, in spite of having a last (cheese)name that hints at my Italian roots, I recently found out I’m 28% Irish, so celebrating St. Patrick’s suddenly seems all the more important. New York City honors the holiday with a day long parade that finishes close to my workplace and then the night is consumed with a lot of excessive drinking at any and every watering hole. But I recently heard that the more authentic Irish way of celebrating is to spend the day with your family, in a style similar to the North American holiday of Thanksgiving. Thus it was, that in an effort to share my cheese consumption with others, this time round I enjoyed an afternoon cheese fest with my good friend Jindi Brie as well as the Sirene girls. Because it’s an easy pitstop on my way home, I had returned to the Murray’s counter in Grand Central Market to pick up a sampling of Irish cheeses. 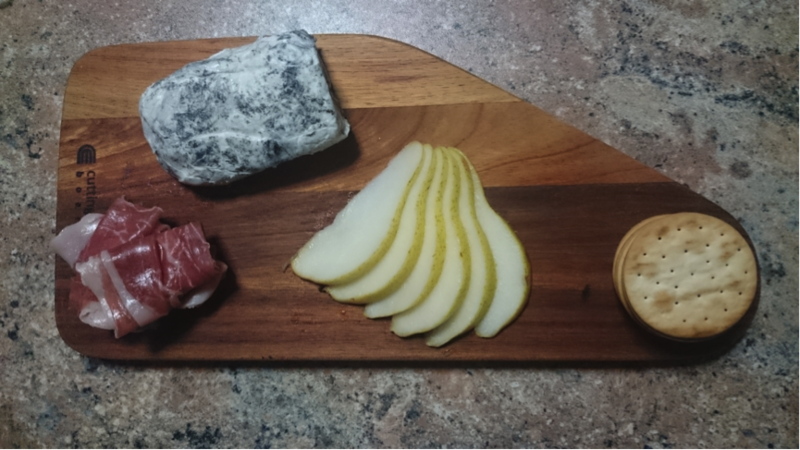 I selected their Irish Cheddar from Dublin, appropriately wrapped in a green wax; Coolea (Koo/lay), a Gouda-like cheese made by some Dutch immigrants now resident in Co. Cork; and Ardrahan (Ard/RAH/han), a washed rind creation, also from the Cork region. On the side, there were two kinds of crackers from Sheridan’s Cheesemongers, the brown-bread and rye & linseed varieties. The cheddar was an easy favorite amongst all of us. Jindi Brie & I also both enjoyed the Coolea with its sharper, nuttier overtones. And then there was Ardrahan… it had been seriously stinking up my fridge since I’d brought it home Friday evening. While the Murray’s counter gal hadn’t urged me to eat it straightaway, I sensed she may have been new, since she miscorrected my reasonably close pronunciations of Coolea and Ardrahan as “Koo/leah” and “Are/dra/HAN”. In consulting its label, I saw that Ardrahan may have developed its pungent aroma from having been washed in briny saltwater. But while there are definitely some stinky cheeses out there that when placed into one’s mouth transform and bloom, this one did not. Murray’s claimed it was one of “the most approachable washed rinds” available but considering we elected to place this cheese outside until I left Jindi Brie’s house, I’d say it was far from “approachable”! I feel a little sorry for giving up on this stinky beast after only one wincing bite. So, if any of my fellow turophiles feel up to the challenge, please check if your local cheesemonger carries it and report back if you decide to bravely try it. Maybe I just had an initial bad experience like The Comte did with Swag and should have consumed it post-haste on the train ride home from the city? 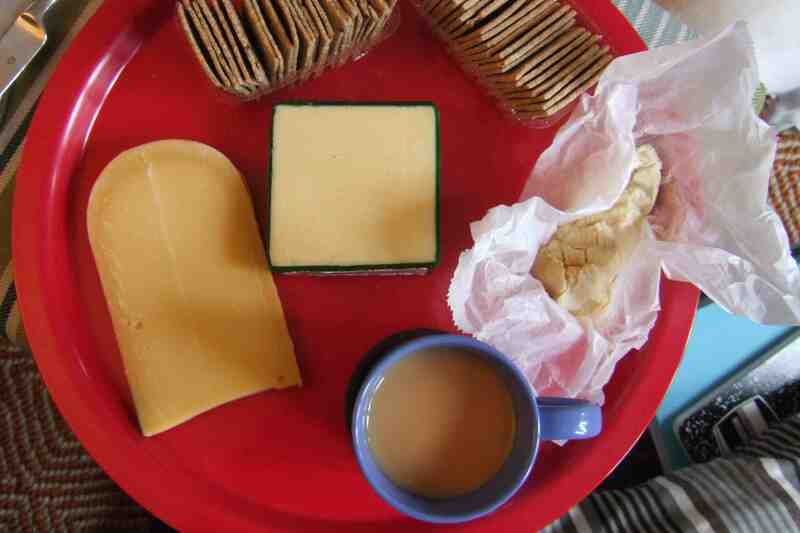 I carried my cheese fest over into the following day, when I took the leftover cheddar, Coolea, and crackers along with some special St. Paddy’s treats from my favorite bakery, over to share with my friends, the Sternschnuppe family. We shared an afternoon tea together happily munching upon cheese, crackers, cupcakes, and soda bread. These friends are not afraid of stinky cheeses, so I was slightly regretful that I had not saved the rejected Ardrahan for a second sampling. However, it’s probably best that I prevented the possibility of causing anyone else to turn “green” from merely being in the same room as this cheese! As you’re probably aware Australia is not particularly known for its cheese. That’s not to say we don’t love our cheese, we do, and we make damn good cheese. It’s just that where the French have Camembert, Brie de Meaux, Roquefort etc etc etc, the Swiss have Gruyère and the United States have “Swiss Cheese” (do we need to ask?) Australia, having stylishly appropriated and even adapted the cheeses of the world, never really needed to come up with its own. Despite this, as I am Australian, and this is my first formal “cheesing”, I felt that I should post on an Australian cheese. If not Australian in invention, Australian in spirit. Sadly my cheesing was scheduled in a frantic week of packing up the Little Lady (my Mother) and moving her from our family farm to a one bedroom apartment in the city. This involved a farm, a van and a 9 hour drive from Melbourne to rural NSW with a stop over in Gundagai. Known for the Dog on the Tuckerbox and the perfectly catchy song Along the Road to Gundagai this mid-way stop-over was unlikely to be a font of all cheese, particularly at midnight. Similarly, my home town’s supermarket offerings were more likely to offer me wheels of cream cheese mixed with apricots and almonds than anything post-worthy. This made my plan to source an iconically Australian cheese difficult, but not impossible. Recalling the recent renovation of the Epic IGA of Laziness (its across the road) I decided to consult the Wall of Cheese prior to my departure. As tempting as it was to select the Comté (for obvious reasons) my commitment to the cause was rewarded with: SWAG. Whilst you could be forgiven for thinking this cheese was touting itself as THE cheese, complete with saunter and arrogant side-cocked head nod, this little roll invoked quite a different image for me. For Australians, particularly those of us who are used to driving over 16 hours to attend a friend’s 21st birthday party or waking up next to a not-overly-familiar face after an intoxicating night at a B&S, a Swag is a portable, rolled up, waterproof bed. Swags have been called the “furniture of the bush”, “the traditional bedding for outdoor sleeping” and, not to exaggerate at all, as “standing for house and home and life’s achievement”. Given the shape, colour and origin of this cheese I was confident that SWAG was the bush furniture of cheese, not the Kanye West of cheese (or Cheezus). 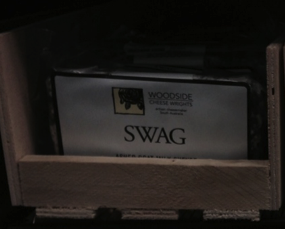 Made by South Australia’s Woodside Cheese Wrights, SWAG is an ashed fresh chèvre. 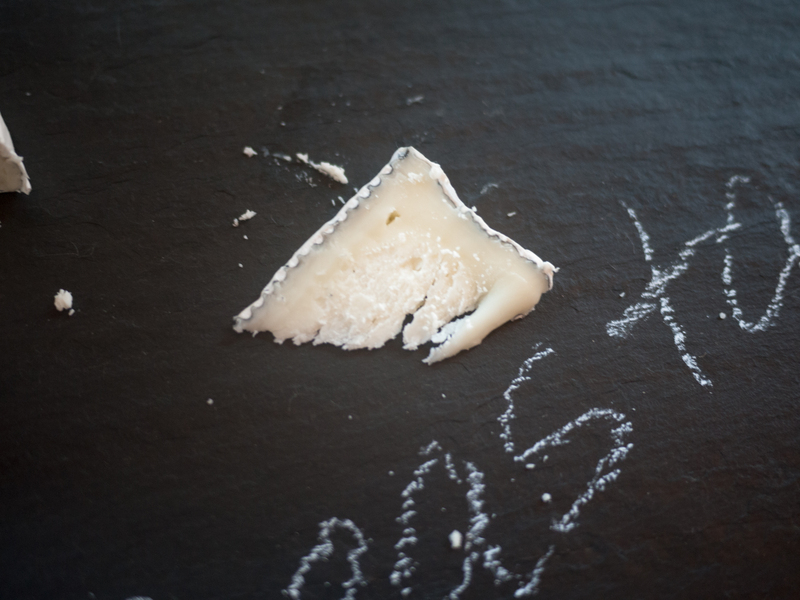 The makers say it was developed to “showcase the freshness of our chèvre” and that the ash gives it “the perfect balance of creaminess and acidity”. So, with my bags packed and SWAG bundled up in my neoprene cooler bag I hit the road through Gundagai. Arriving at my Mother’s in the early evening of the following day I spent far too long arranging pear slices while hyping up the SWAG experience to hungry family members. Finally, I was ready for that first bite. Oh dear. This was not what I had expected. There was an overwhelming acidity, almost vinegary, at the front of every mouthful. I tried to get past it to the thick creaminess being hinted at. I tried the pear. I tried the prosciutto. I smothered the quince paste, searching for an avenue of delight but there was none to be found. Family members looked at me with doubt, waiting before they cast aspersions on my cheese choice save I waxed lyrical but sighed in collective relief when I removed the platter from the table. I was concerned though. SWAG had just been on a 24 hour journey, riding for 12 hours in the front of a van in the Australian summer, and sleeping over in a bar fridge that had seen a few rounds. What if this was my fault? Keen to ease my conscience, I delayed my post until I had returned home and revisited the Wall of Cheese for another SWAG. The creaminess I had been teased with at first was most definitely the star of the dish* and gone was the acid wash that opposed the goat. Instead, the familiar pungency of the chèvre was perfectly balanced by the unctuous texture and I promptly proceeded to eat half of it. In 3 minutes. With quince, without quince; with pear, with apple, without either; with prosciutto, without anything. Gone. I will most definitely be buying this cheese again: for cheese boards, salad sprinkling and tart topping. It won’t, however, feature heavily (if at all) in dishes intended to be shared with chèvre-sensitive guests. This is not a conversion cheese. Whilst there is little pungency upfront, it kicks in later and lingers on the back palate. The response from The Mann, a chèvre-sensitive from way back, was to hand me the second half of his cracker. Quickly. The moral of this story is – neoprene cooler bags are not made for cross-country Australia, and SWAG has swag after all. Now, where did I put that other half? * Apologies, shameful My Kitchen Rules reference.